Microsoft has released Security Advisory 2286198, which provides details on the LNK shortcut (Windows Shell) vulnerability that's currently being exploited by the Stuxnet rootkit. Besides USB devices, the Windows Shell vulnerability can also be exploited via Windows file shares and WebDav. 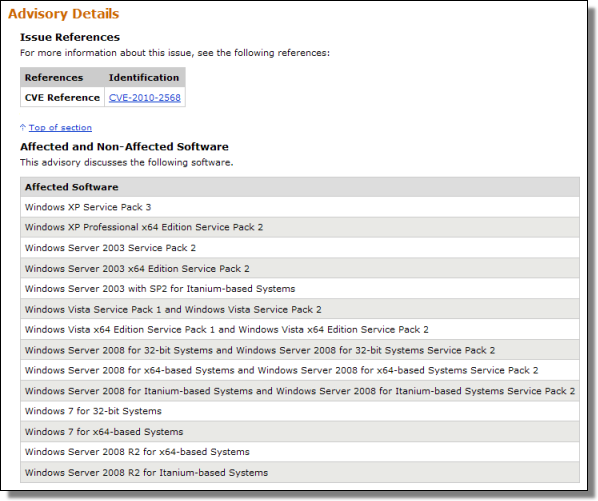 Vulnerable versions include Windows XP Service Pack 2 which is not listed by the advisory due to its recent end-of-support status. See Microsoft's Security Advisory for details.